Samuel L. Jackson’s Nick Fury has been a stamp in most Marvel film so far. He’s there to connect each movie to the same Marvel Universe and as you know is the man whose assembling The Avengers. At one point Jackson said he would not be appearing in Marvels Thor film though, but it looks as if that wasn’t correct. Nick Fury will most definitley show up in both Thor and Captain America: The First Avenger in equal measure. It doesn't look like it was planned until later on in the production though. In the next month or so, I have to do one day on Thor, and I gotta do another day on Captain America, and in April we start The Avengers — the big deal with everybody. Thor and Captain America are pretty much done, but I haven’t done my part in them yet. I’m just connective tissue for them to join The Avengers. It’s no surprise that once again his role in these Marvel films will be a small one, but of course it’s necessary to get the Avengers together for a big pizza party. I’m incredibly excited for The Avengers, as I’m sure many of you are as well. Jackson goes on to reveal that he will actually have a female companion/sidekick in the film. I gotta screen test like five actresses on Friday. They have this new character that’s my sidekick or something, that’s with me all the time. The big question is? Who do you think his Sidekick will end up being? Could this be Wasp? Watch Jackson below talk abou these films and tell us what you think! 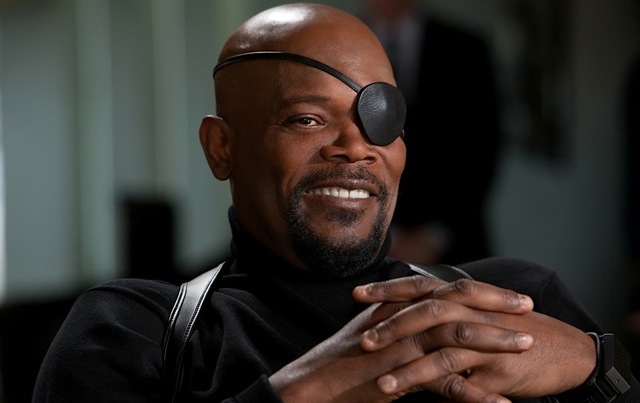 Samuel L. Jackson Says Nick Fury Will Have "Another Guy's Face" in CAPTAIN MARVEL... What!? Will Nick Fury's Backstory Be Included in CAPTAIN AMERICA 2?